Happy New Year guys! 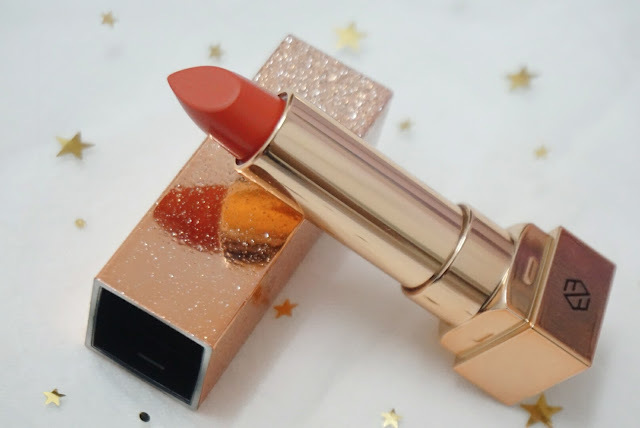 So my first post of the year will be about beauty review. 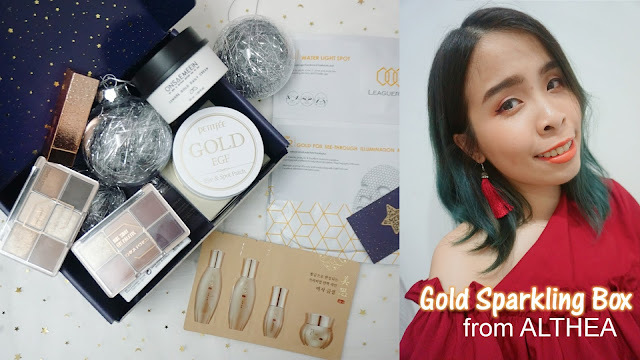 I got this really pretty makeup and skincare from Gold Sparkling Box. It was one of their beauty boxes series from ALTHEA itself. They come out with 3 Sparkling boxes during the festive season, that is Red, Gold, and Black I do know that festive season is over, however this box is specially curated not only for festive but to any event you wish to attend like, wedding and girls date out. It was one of the emergency sparkling boxes I would say, because during any last minute event plan with a friend. This Gold Sparkling Box is the perfect sparkling box you need, for you to stay pretty and sparkling whole day! 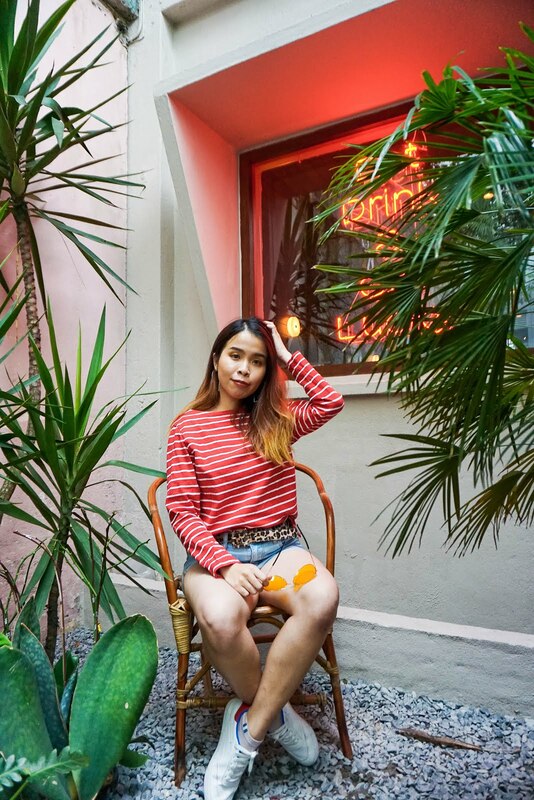 Althea beauty boxes are curated by the fairy team in Seoul. There will be 2-3 thematic boxes every month! It was prepared in limited quantity and each box contains 5-12 full-size beauty products depending on the theme and value. The best part about this beauty box is there is no commitment for subscriptions, just buy it if you like it!! 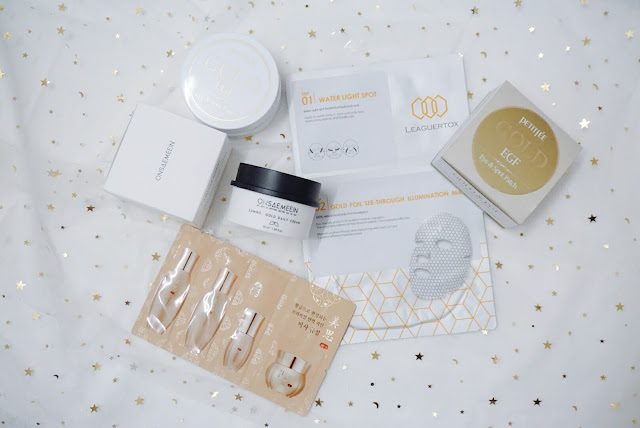 Discover some new k-beauty product inside Althea Beauty Box. But the downside is these beauty boxes are limited in quantity (while stocks last) on a first come first serve basis. 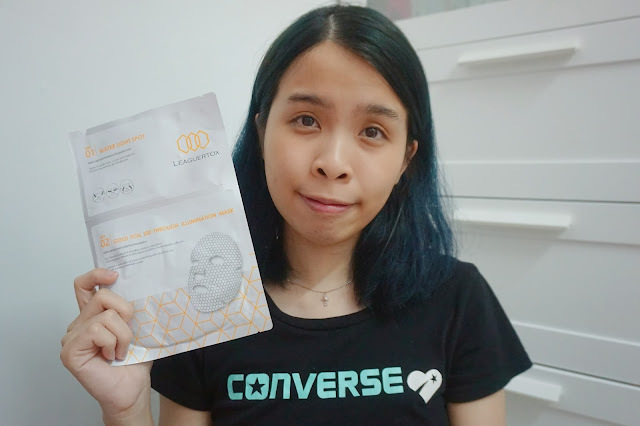 Let's start off with their skin care product in this Box first and continue on with the makeup products! I love using eye patches when I experience tiredness around my eyes. Especially when I am late sleep and facing the laptop the entire day. With this Petitfee Gold & EGF Eye Spot Patch that is made with black pearl collagen and gold powder, which make this a luxurious eye mask is full of amino acids to help regeneration and purification to make the skin more plump and radiant, as well as provide anti-oxidizing and anti-aging effects to these delicate areas. 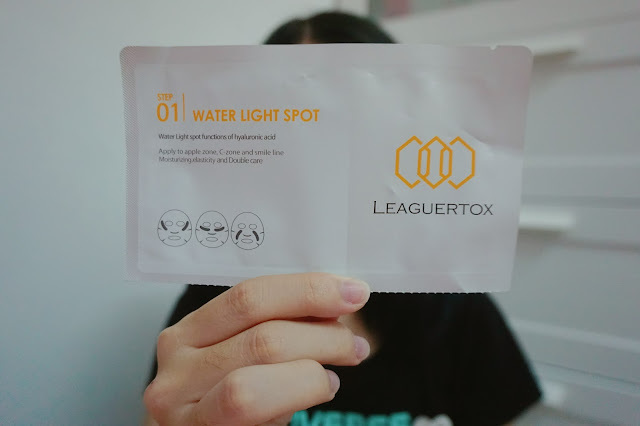 It came in a round container with 60 pieces of patches for eyes and dark spot area. 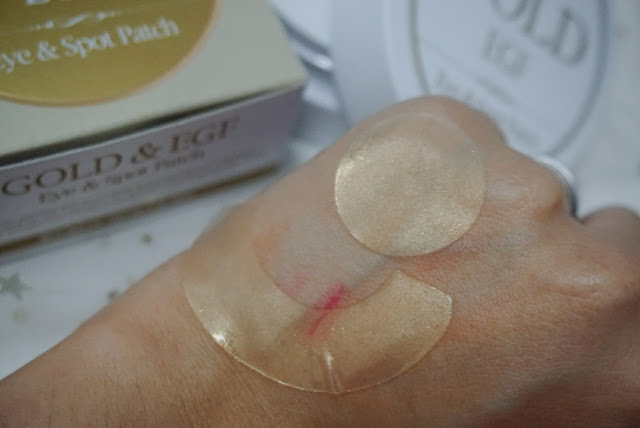 The patches are really soft and come in gold shimmer texture on each of the patches. 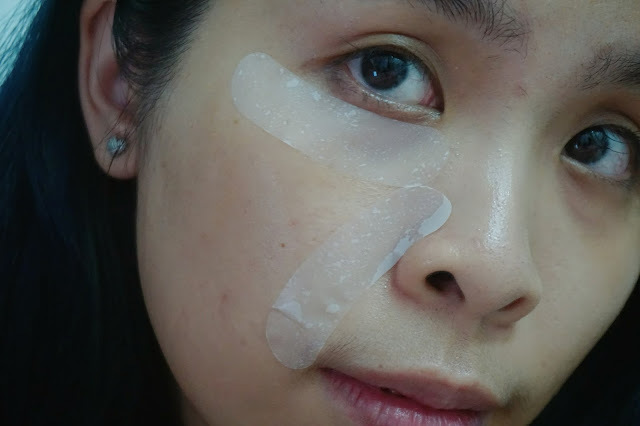 It was in hydrogel patches which help secure the moisture needed for the are we apply. It was a mild cooling sensation when you apply to the area. 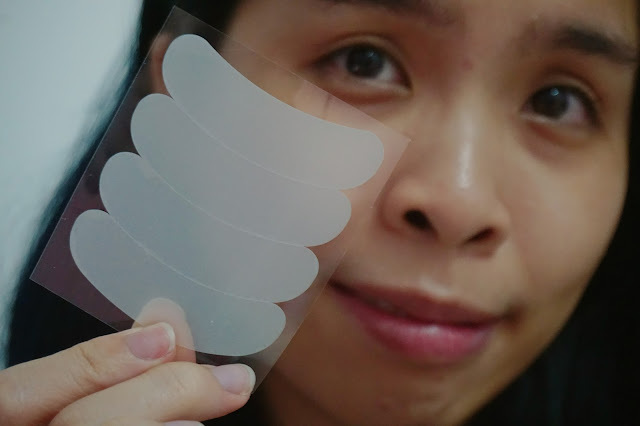 After few minutes, you can feel the area tightens as if it smoothen your wrinkles! 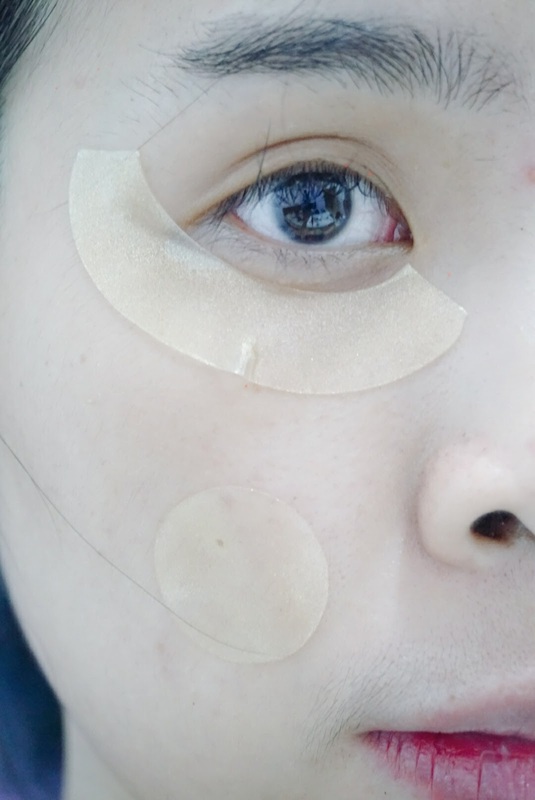 I enjoy myself throughout the process of applying the patches around my face. It was very convenient that we can not only focus on our dark circles but also apply to the dark spot area on our face. 99.9% pure gold. It nutrition permeates into the skin deeply. 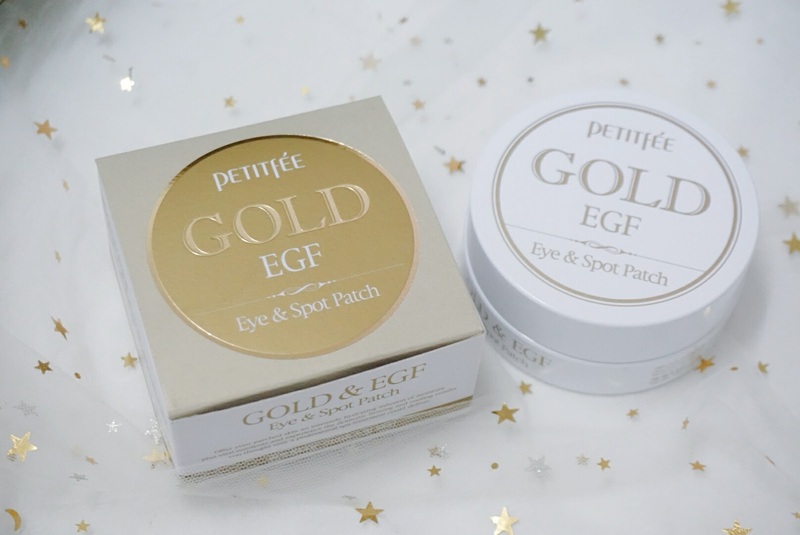 Gold helps protect the skin and soothe our skin. It also helps excrete wastes matter from the body. It also contains propolis extract which is an ingredient made by honey bees mixing pollen, sap, and wax. It helps clean toxic substance, protect, and soothe the skin. Shea Butter moisturizes dry skin and protects the skin from toxic ingredients. 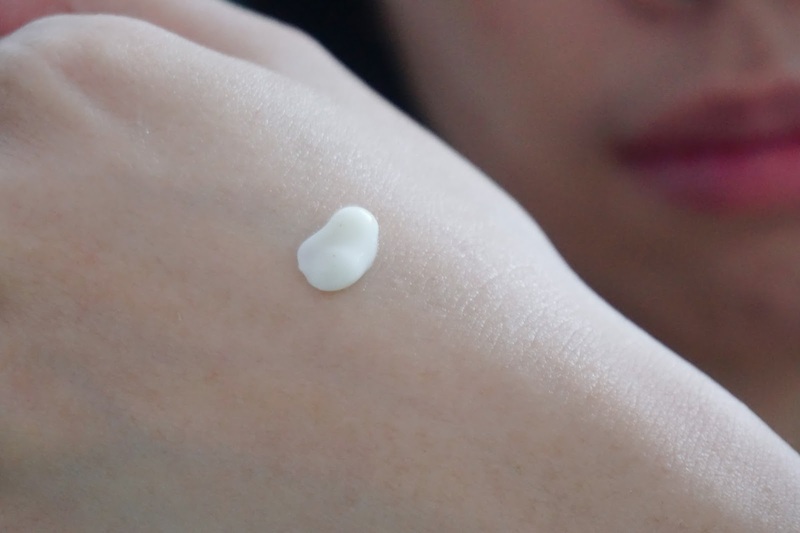 Niacinamide brightens the skin tone and moisturizes the skin. It has the minimal monochrome packaging in black and white. 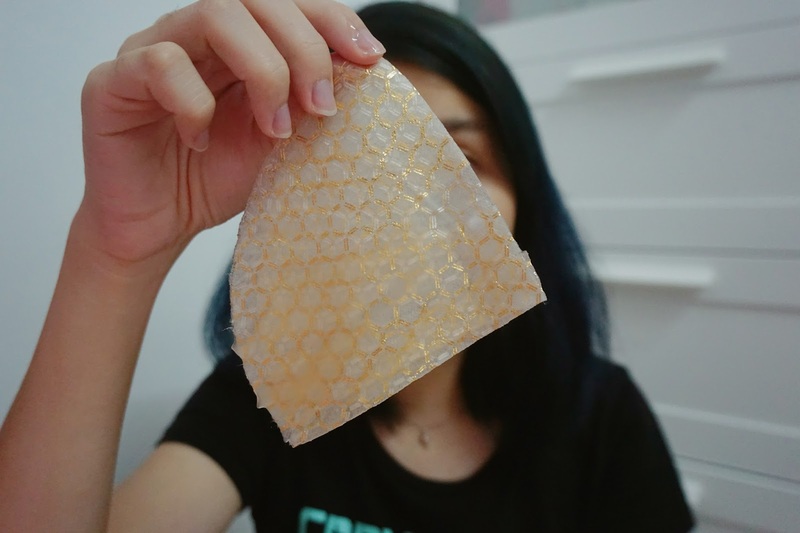 It has a very light creamy scent, which is sweet and not heavy fragrance scent at all. For the first step, apply this water light spot on your Apple Zone, C Zone and Smile line. This helps to keep your clean and clear before applying any skin care. It absorbs the excess oil and impurities around the patches area and leaves my skin clean and matte. It contains Argireline, it was a botox applied with anti-aging cosmetic raw materials obtained by natural protein binding, helping in wrinkle improvement and lifting. 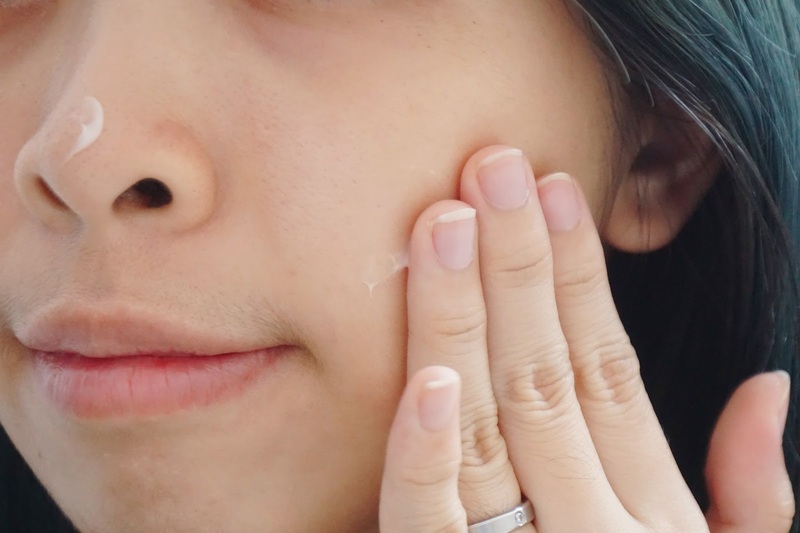 With White-Ca, it is a melanin inhibitory substance using natural plant extracts that brightens the skin and also inhibits the formation of melanin by UV rays. My favorite hyaluronic acid which replenishes moisture in the layers of skin and promotes blood circulation! 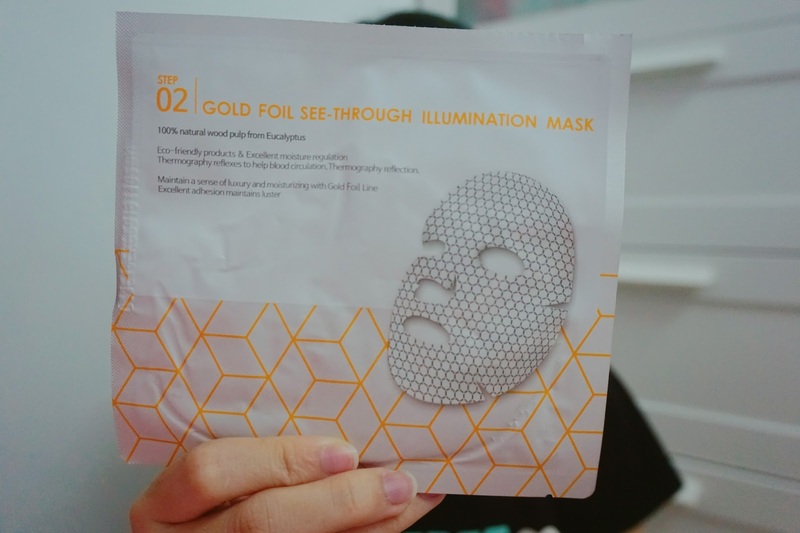 It has the prettiest gold foil design on the face mask itself. 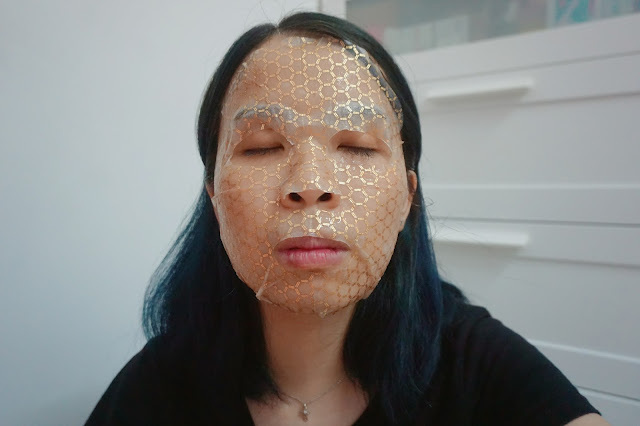 This Hexagonal Gold Foil's thermal reflection sheet opens the pores to effectively transfer active ingredients, providing high moisturizing and clear gloss. Which I actually think that it looks like beehive haha! It was somehow slightly saggy which means it was slightly big and not really fit nicely on my face. 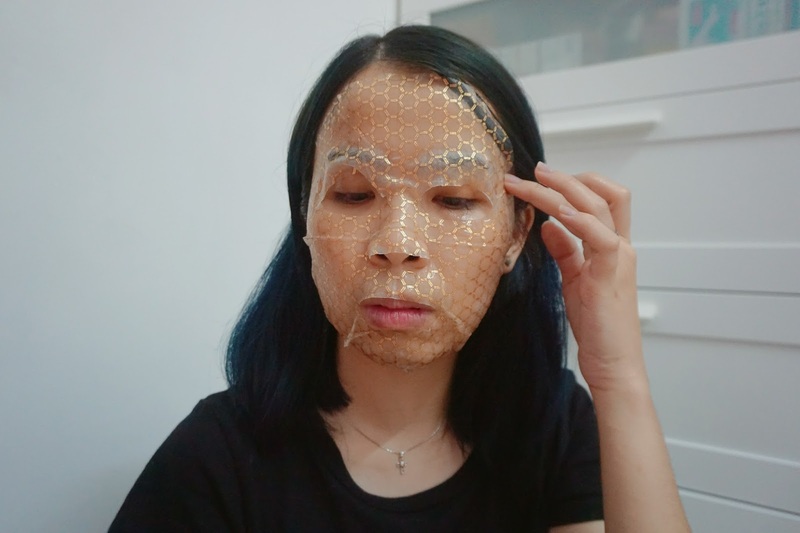 The mask is slimy and causing me takes a longer time to spread out the mask nicely all over my face. It has a really intense essence in the mask which it I really like it. I feel so comfortable when I apply it to my face. 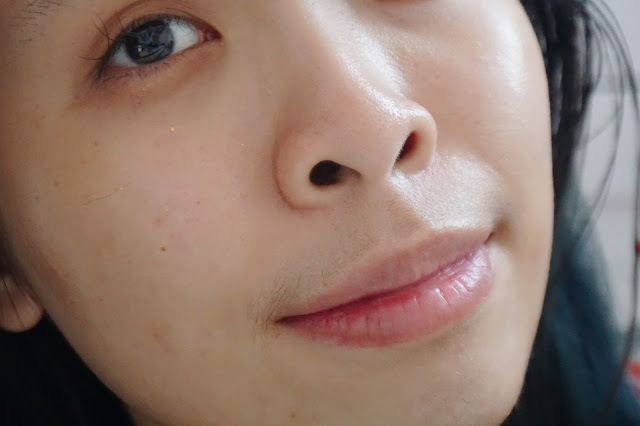 A close look at my face. The essence of the mask stays for around 15 to 30 minutes. 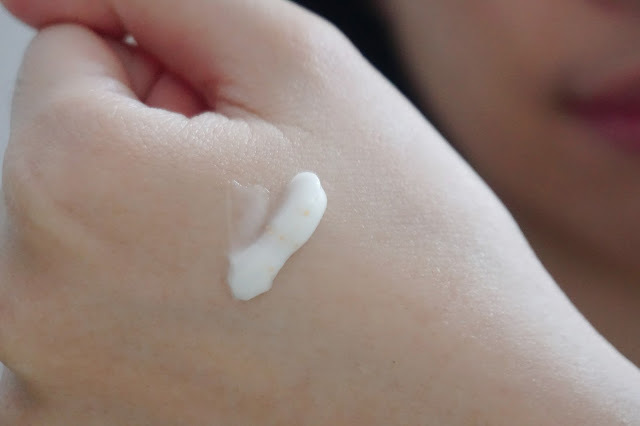 It doesn't leave my skin dry overnight. It gives the instant moisture and boosts up my skin moisture after application. 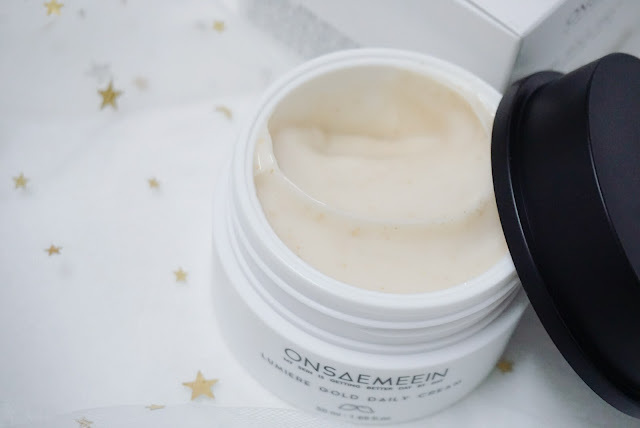 It helps improves my skin suppleness throughout the night too! Major love this mask! 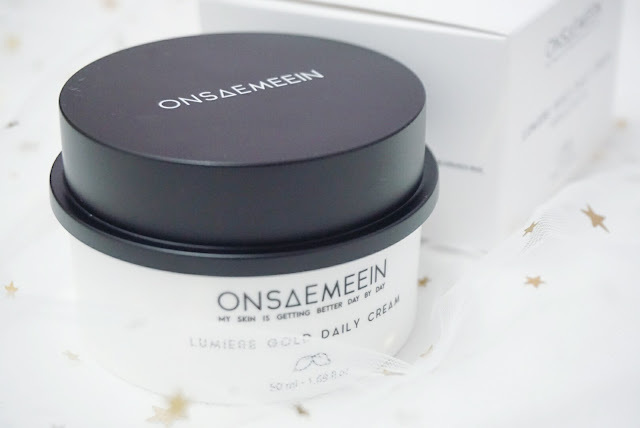 This skincare line fills in a strong gold energy to our inner skin. A nourishing lotion hydrates and plumps the skin. A nourishing enriched essence for firmer skin. A luxurious crema to seal and moisturized for hydrated skin all day long. 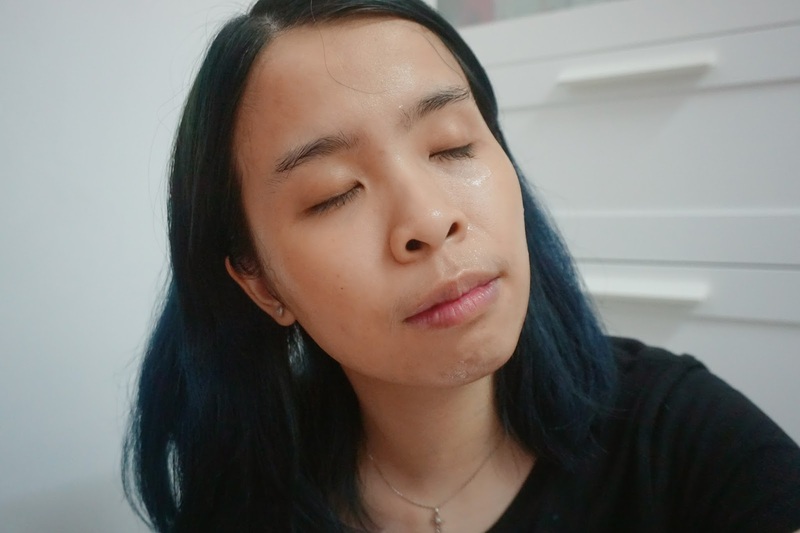 Overall this skincare series is so moisture and give the suppleness that my skin needed so much. It has a mild herbal ginger scent when I apply it on my face. The essence and the cream contain the gold foil. 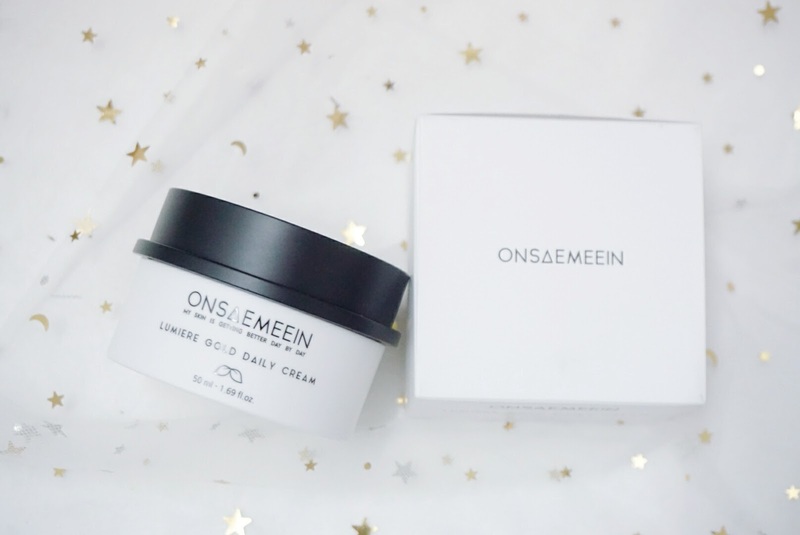 This skin care range just makes my face glowy and shines after applying it to my face. I apply this before I apply the makeup and gosh my makeup last the whole day. I would really be gotten this whole range if I have the chance too! It works so well and effective for my dry skin. That's all for my skincare review from this Gold Sparkling Box. 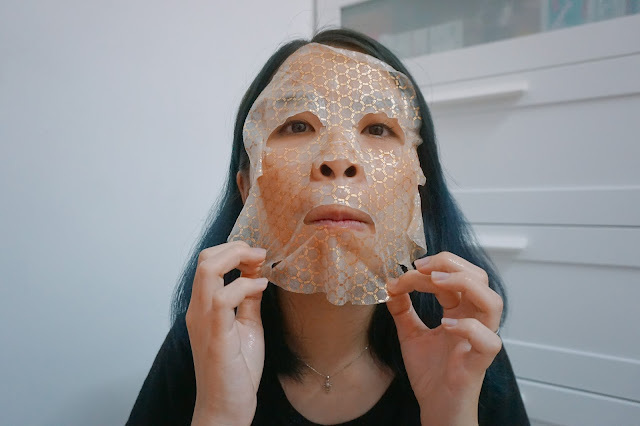 I got total of 3 full-size products includes the sheet mask. The 3 full-size products already more than half price of the box that only cost RM 109 for this Gold Sparkling Box. Comes in 4 variants different palette that perfect for any occasion. 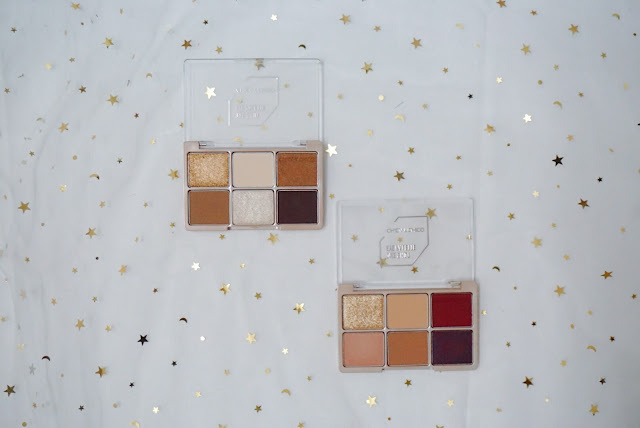 In this Gold Sparkling Box, we have 2 palette which one is perfect for daily eye look and another palette is their new wine burgundy palette which is the new trend color of the year! 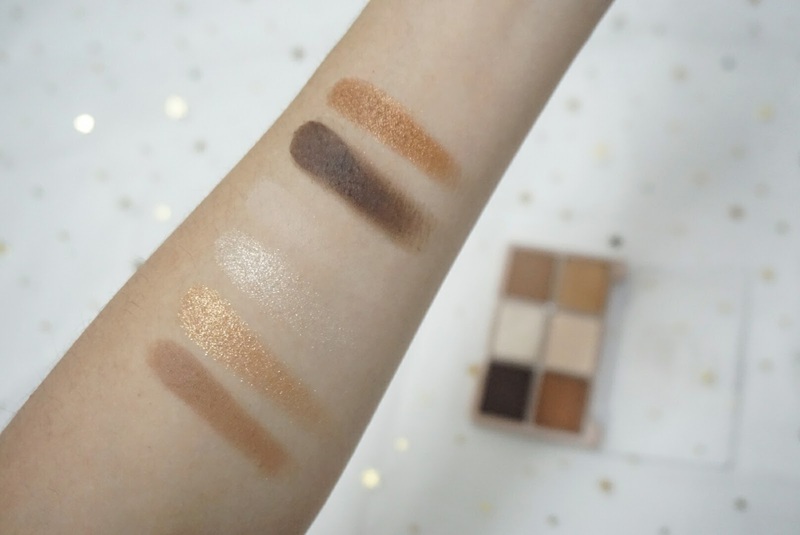 Multifunctional can use as eyebrow, blusher, and even shading! Each palette contains 3 different type of color texture which is Matt, shimmer and glitter color texture in this one palette. Which is perfect for eye look! With its compact size, it was perfect for travel and bring around. 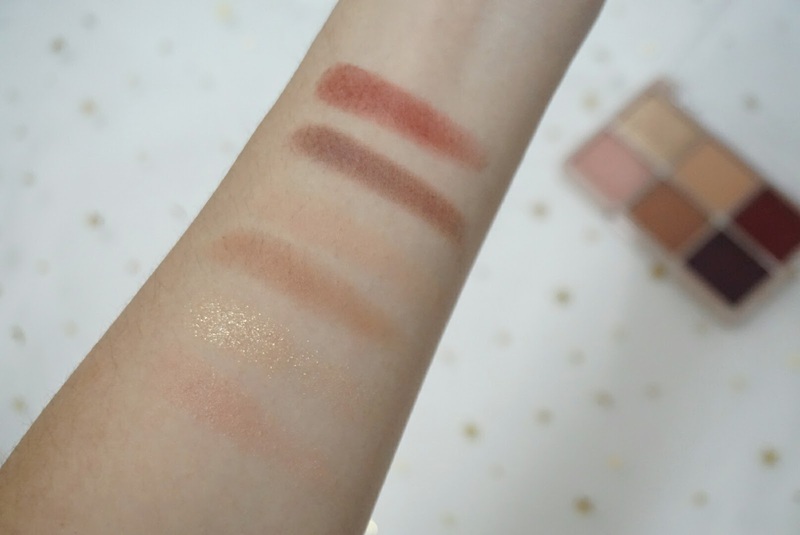 My swatches didn't really show the beautiful color pigment of this eyeshadow. 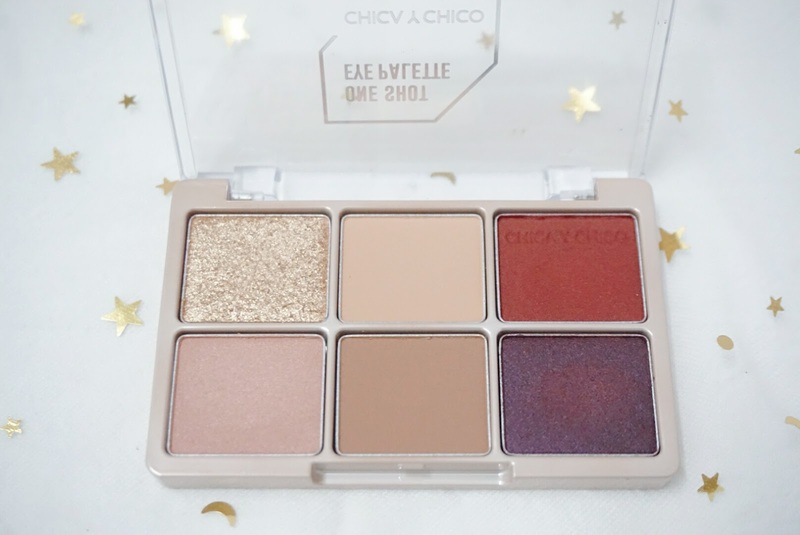 However, I really like the pigment of this palette which it contains the beautiful wine burgundy color which is the perfect color for Winter. It has also had this mystery purple brownish shade too. For the lighter shade, I love the pale pinkish shade and the glitter shade. The application is smooth to apply and easy to blend with another color too. 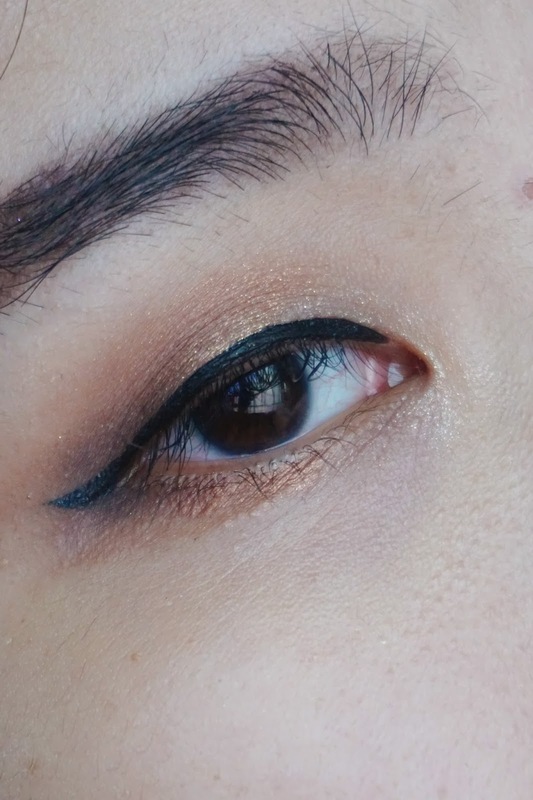 The color is so pigmented that was actually surprised me and I really love the color combination on my eyes. 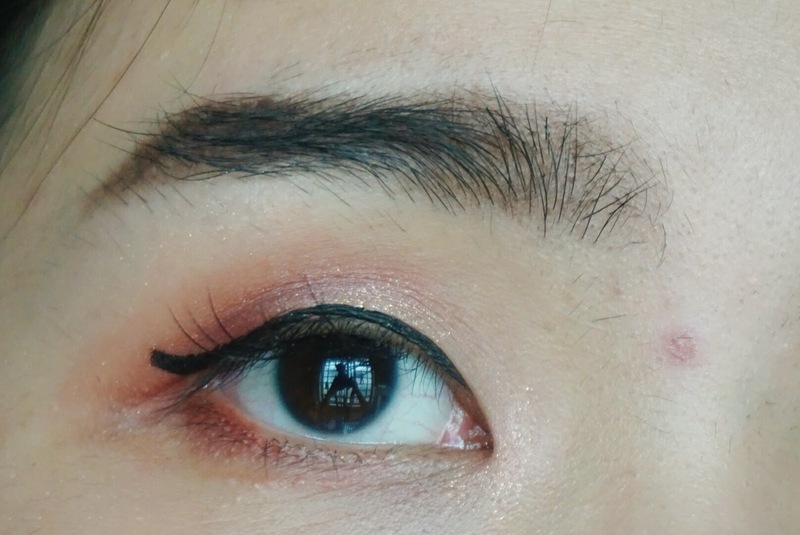 I hardly apply such a vibrant look on my eyes. I am really happy that this palette did a very good job in terms of color pigment and blending. 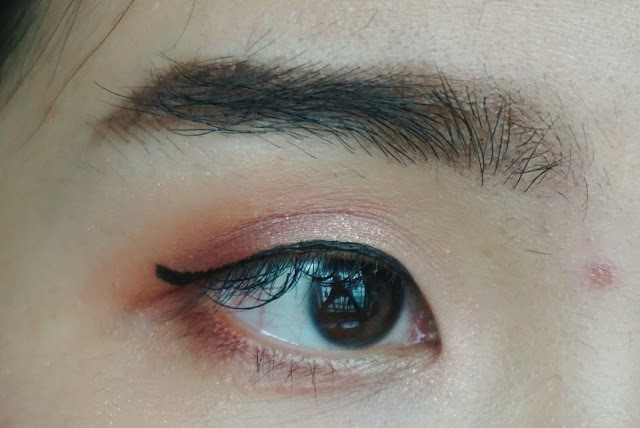 I did a pretty good job in swatching this palette. All the colors are so opac and pigmented. 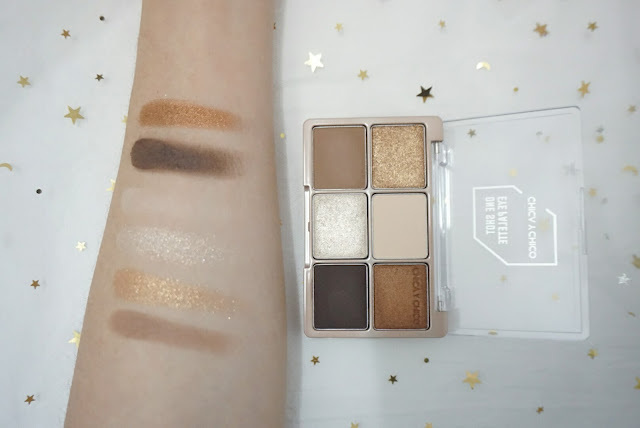 I think it was a pretty palette for those who are the first timer on putting eyeshadow. It was also a perfect daily eyeshadow palette for everyday use too. I got a really good lightning at home, therefore this eye look looks really nice in this picture. I can't explain how much I love all the shades in this palette, all the matte, shimmer and glitter it was all the palette you need. Texture wise it was so smooth and easy to blend all out too. Does it last long? I didn't apply any primer for both these two looks. I am glad that the color on eyes stays it does fade off a bit. In conclusion, the wine burgundy palette is my favorite because I like the color that is fun and looks good on me. As for the day drink palette, it was highly recommended for those first timers and wanted to get your first eyeshadow palette. 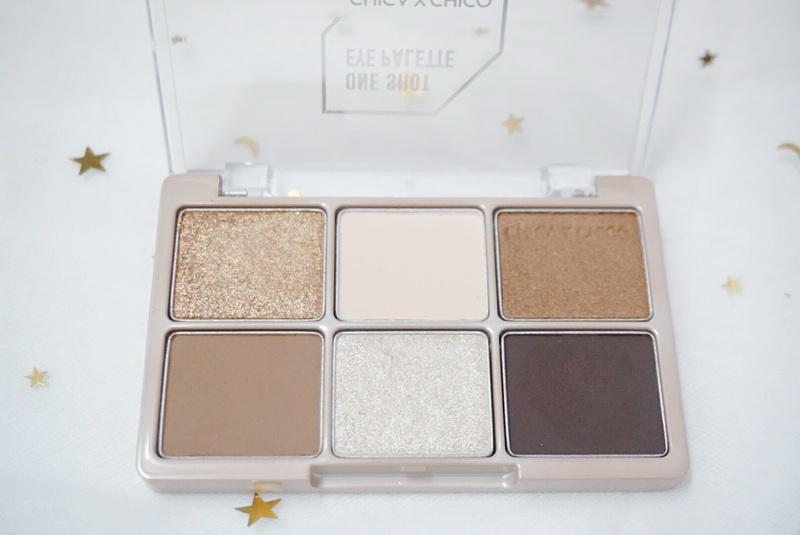 This is the perfect palette you should get for yourself! It plumps up the lips and making our lips look younger and sexier. 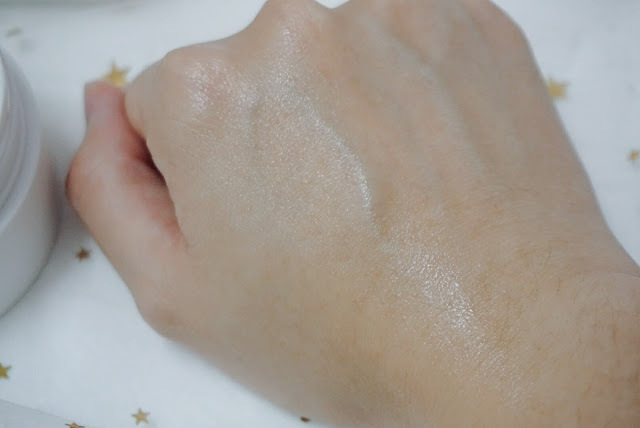 It also has the silky velvet color from their dispersion reflection of the light from their soft-light feel powder. It lasts up to 27 hours like a semi-permanent tattoo. It has the function as, lip balm + lip plumper + lipstick + lip tint + lip treatment. 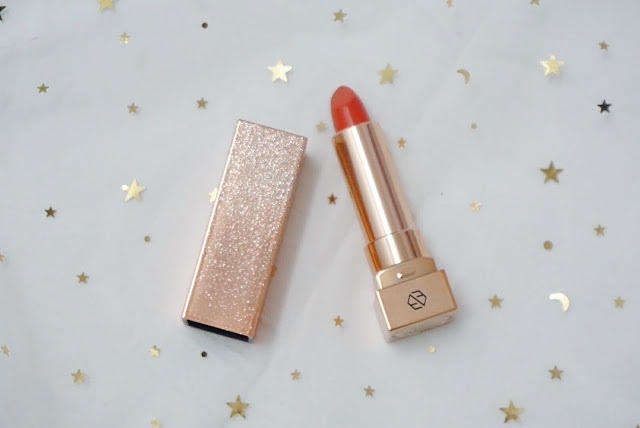 It contains rosehip fruit oil, macadamia seed oil, cacao seed butter and jojoba seed oil that gives the smooth moisture coating layer for your lips. This packaging has been caught my attention when it first launches in ALTHEA. Finally, it was included in this Gold Sparkling Box, none other than because of its super sparkly case. The case itself is rough sparkly texture and the lipstick itself is a sleek gold design. Sorry for the unattractive lip swatches due to not enough lightning when I shoot the entire look at other places. 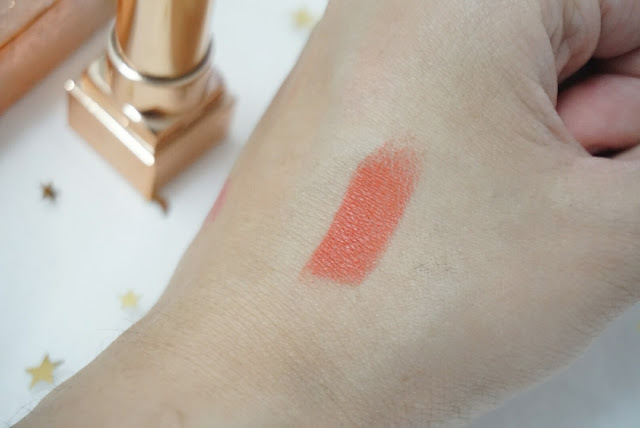 This is a coral peachy shade but more to a brighter tone which makes me looks younger when I apply it all to my lips. It looks neon bright too when it was under the direct light too. 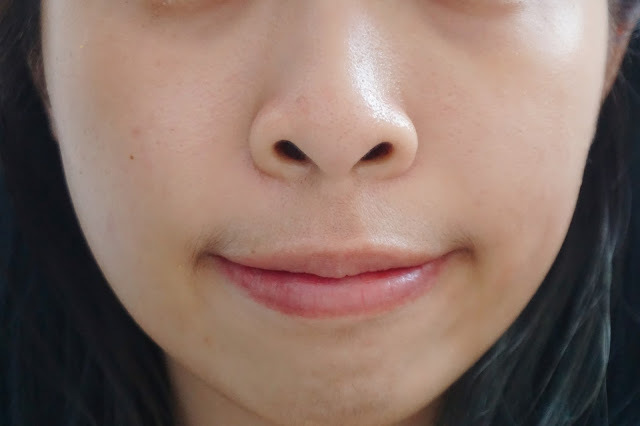 When I first apply on my lips, I can feel a tingling cooling sensation on my lips as it functioned as a lip plumper and lip treatment for the lips. 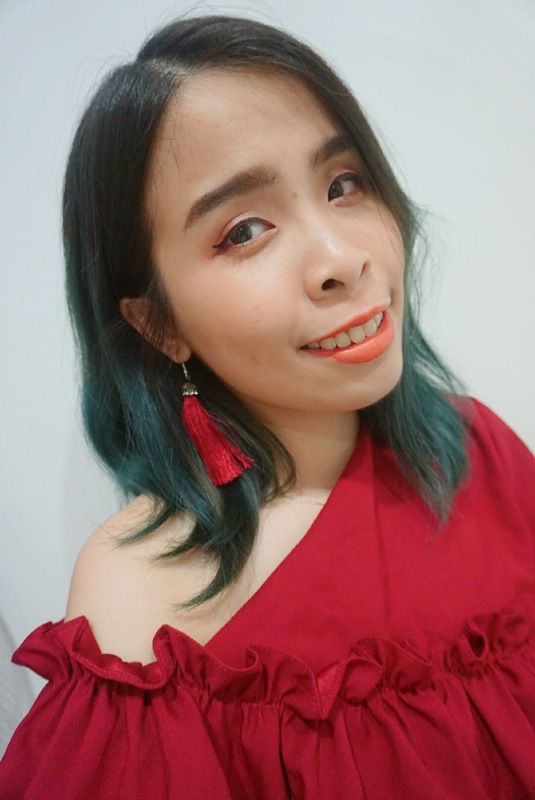 The color looks really bright on my lips which makes me looks more younger too! 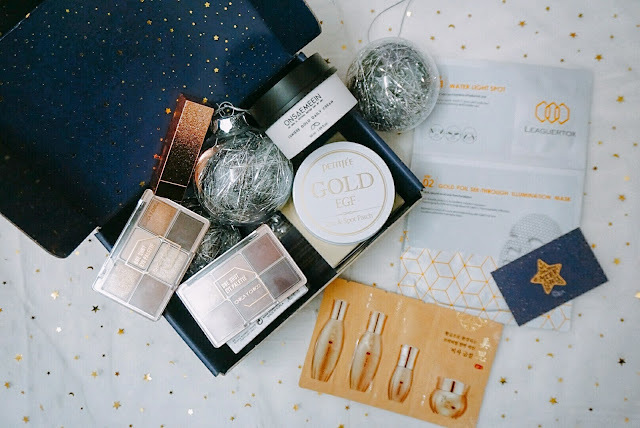 Three full-size makeup in this Gold Sparkling Box! My favorite is both of the palettes which I am really obsessed with. 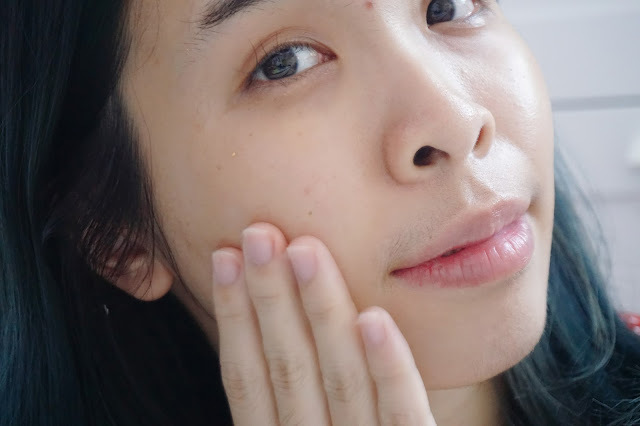 That's all for my review Gold Sparkling Box from ALTHEA Beauty Box series. This box is currently out of stock from ALTHEA website. However, you can get each or the product separate from ALTHEA. If you ask me if it worth for me to buy it? I will definitely say YES! 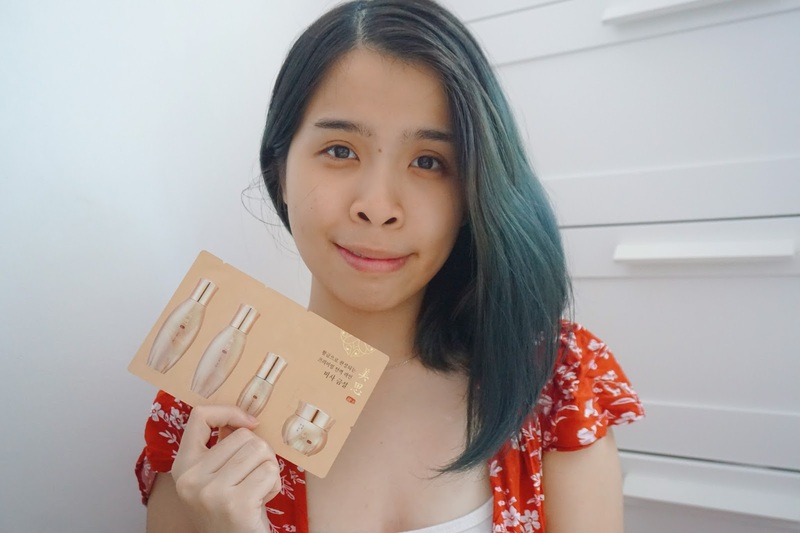 Hope for more cute and pretty beauty box launches from ALTHEA. I am always excited for each month for the beauty box. Not only for skin care or makeup, sometimes it comes out with products for hair and nail lover! 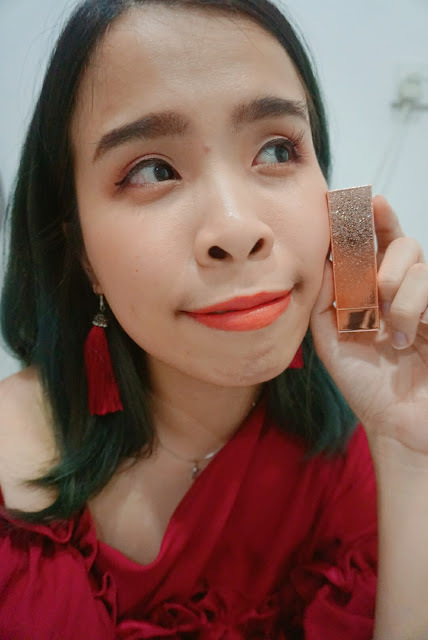 Do check out the link below for more beauty box selection! Sometimes they might even restock too. 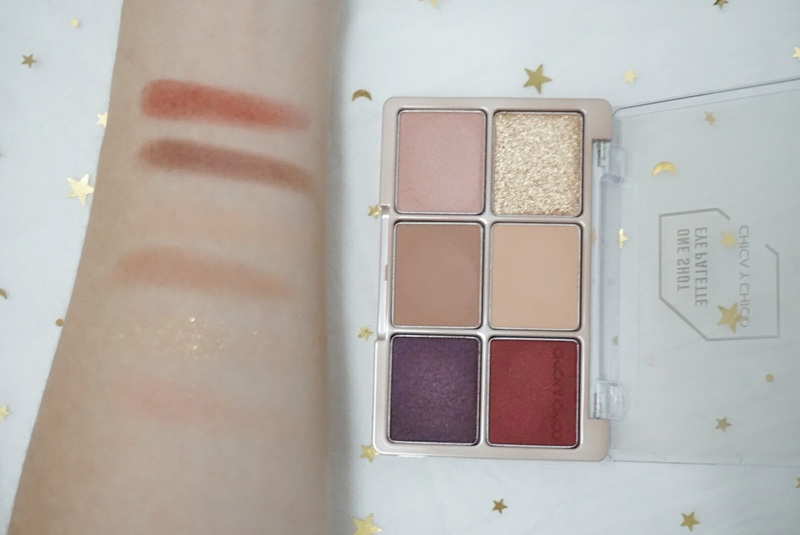 The eye palettes really gives out beautiful colours and I am loving it on you. Beautiful! Oh yes. I will check out the masks too. Thanks Rawlin! 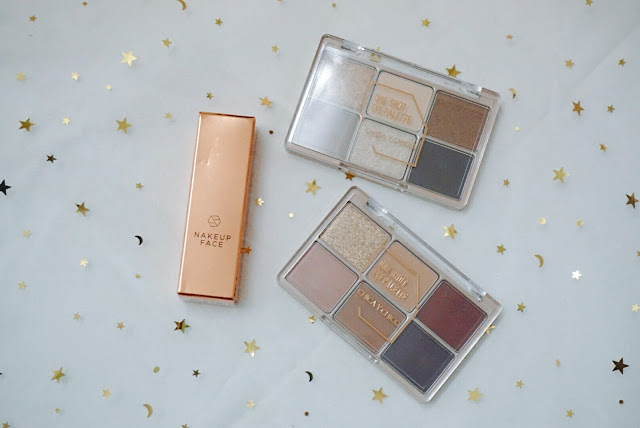 I am in love both of the palettes! So envious of your Gold Sparkling Box. It's full of items that I can use myself, especially the masks! The price is really good, too. So affordable and worth it!! That box from althea looks really good and have a lot of beauty products. and it seems that you are really satisfied with that box. Omg this box is so damn good! I like the Chico-y-chica eyeshadow you got. Luxurious! omg! i need that eye and spot patch so bad!! mine is getting worst.. must check it out! Time to put on some eye mask!